Carl Cox will be playing at San Francisco’s Midway on 30th March in order to raise funds for his annual Playground camp at this year’s Burning Man festival. Coxy has been playing the iconic festival for over a decade and along with his own rise in popularity, his Playground camp has quickly become one of the festival’s many highlights. For his fundraising show in San Francisco, Coxy will be performing alongside Joseph Capriati, Syd Gris, Brennen Grey, Rooz, Kramer, Tamo and Paul Skinback. 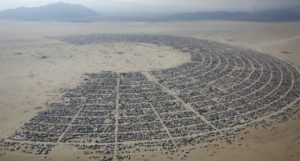 According to the press release, Burning Man represents a special place for the former Space resident and he hopes that with the money raised he’ll be able to create an incredible stage production for this year’s Burn. “Carl started his Playground camp as a way to celebrate all that Burning Man is and as a way to give back to a culture that he loves,” the press release reads. “It started small and most who landed in the camp that first year were those just passing by to get someplace else, but the music and vibe pulled them in. In other Burning Man news, the festival’s organisers have warned fans to be wary of a ticket scam which has targeted Fyre Festival attendees who, let’s face it, have suffered enough.